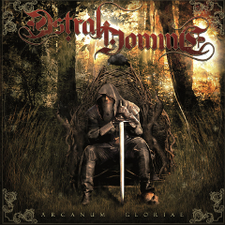 Italian Symphonic Power Metal band ASTRAL DOMINE will release in worldwide their debut album "Arcanum Gloriae" through Bakerteam Records on January 21st 2014. The band was founded in 2011 as his project by music composer and lyricist Luca Gagnoni with the intent of creating epic, powerful music with a peaceful message. Produced by the band themselves, with mixing and mastering duties held by Andrea De Paoli (Labyrinth, Vision Divine) at Multimedia Sound Studio. "Arcanum Gloriae" features special guest appearances by renowned singers Fabio Lione (Rhapsody Of Fire, Vision Divine, Hollow Haze) on the song "Where Heroes Die" and Giuseppe “Ciape” Cialone (Rosae Crucis) on the song "Falsi Dei". Inspired by fantasy themes and landscapes, ASTRAL DOMINE’s music is perfectly depicted like the evocative album artwork, which recalls the epic scenery of the Game Of Thrones series.